I'm new to this community but wanted to share anyways. :)I am in North Central (just east of the Rockies) Colorado. Still learning to be successful when weather and soil are all against me. 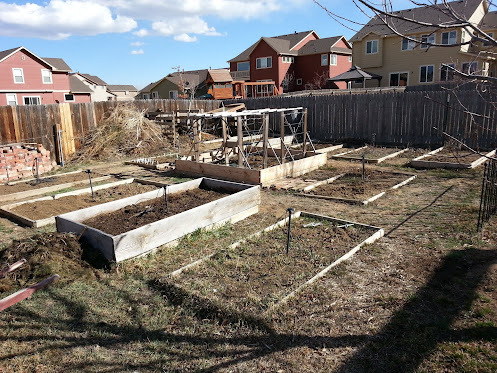 So, if anyone is between Denver and Ft Collins and has any suggestions - fire away!I have 10 raised beds that are 4'x8' and one that is 8'x8'. I also have grapes, berry bushes and will be slowly adding more around the remainder of the yard over the next several years. And, we now have an 8'x18' green house that used to be our back porch. That is almost done and am looking forward to having year round salads, herbs and whatever else we can successfully grow inside. We got 4-1/2 beds weeded and turned yesterday. Planted Garlic, Leek, Potatoes, Raspberry and Strawberry as well. Also picked up seeds to start inside: 3 types of Tomatoes and 4 types of Bell Peppers - all organic and most are heirloom.